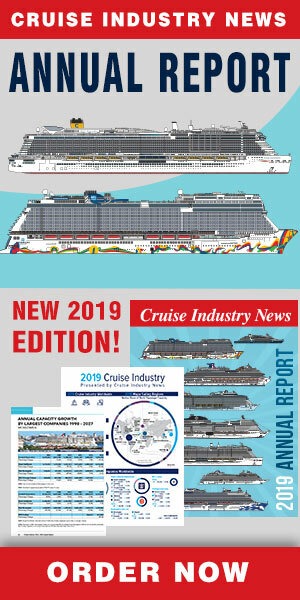 "As the world's largest cruise company with a portfolio of nine industry-leading global cruise lines, we are the clear market leader in China and very well positioned to continue working with officials in China to help the country meet its goal of becoming one of the most important cruise markets in the world," said Arnold Donald, CEO. "Today's announcement underscores our deep commitment to China as a market of great strategic importance for our company. Alan is one of the most respected leaders in the industry and having him on the ground in China will add great strength to our operation and growth opportunities in China." Buckelew's experience in Asia is extensive, previously serving as the CEO of Princess Cruises before taking on the assignment of Chief Operations Officer for Carnival Corporation & plc. In his expanded role, he will lead all of the company's initiatives in China, while also continuing to provide oversight of all maritime and port operations around the world and a number of related functions as part of his COO role. "We are excited about our cruise ships currently serving the Chinese market and the vast potential to grow our business in China in the months and years to come," Buckelew said in the prepared statement "Our team in China is dedicated and passionate about delivering a unique experience designed to exceed the expectations of every guest who boards one of our ships." This past May, the company announced Costa Serena will deploy year-round in China next year, making Carnival Corporation the first global cruise company with four ships based in China, one of the world's fastest-growing cruise markets. Costa Cruises plans to debut Costa Serena in Shanghai in April 2015, where it will join Costa Victoria and Costa Atlantica, sister ships already deployed in China. The move will increase Costa's overall capacity in Asia by 74 percent. Adding a third ship based in China this year increases Carnival Corporation's total 2014 capacity in the country by 66 percent. In 2015, with four ships based in China for the first time, Carnival's capacity is expected to jump 140 percent over a two-year period. "As we execute our strategy to accelerate growth in China, we have the benefit of eight years of experience in China to not only help guide our expansion, but also find unique ways to delight our guests with the joy of cruising," Buckelew said. With a career spanning more than 37 years in the cruise industry, Buckelew served as chief executive officer of Princess Cruises from June 2007 and served as the line's president since February 2004. In addition, he also served as chief operating officer for Cunard Line from 2004 to 2007. Buckelew has a breadth of experience across cruise operations, having served as executive vice president responsible for Princess's strategic planning, marketing and yield management services. Before that, he held various other high-level executive positions in customer service, shared services and yield management. He also held roles as chief information officer and chief financial officer of Princess. Buckelew served in US Army in 1969 and 1970. He holds an MBA and bachelor's degree from the University of California at Los Angeles.